At Gayety’s, the candy is handmade and the ice cream is fresh. It’s been that way since Uncle Jim Papageorge opened his first ice cream parlor in 1920, in Chicago’s South Shore neighborhood. Gayety’s sells a lovely $11 four-piece box of hand-dipped truffles, made from mouth-watering amaretto, caramel, raspberry and tiramisu—an elegant stocking stuffer. 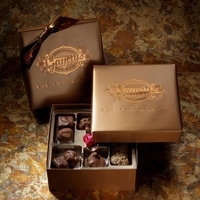 “It’s a strong-looking box, to represent our solid chocolate and the City of Big Shoulders,” says co-owner Beth Flessor. For a delightful holiday dessert, scoop up quarts of Gayety’s gourmet vanilla bean, peppermint and classic chocolate chip ice cream. Top off that sweet Christmas treat with ladles of homemade hot fudge and caramel topping, sold in pints for $10. The joke’s on you with this twisted design. 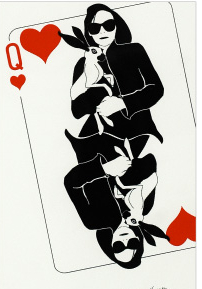 Binth, a print and stationery company, hawks a deck of “Joker” playing cards, retailing for $10. It pictures sinister women clutching white rabbits, mirror images of pole-balancing boars, and twin sly foxes in dainty dresses. For a calmer feel, there’s Binth Matching Game. Simply turn over tiles and find the pairs. The forty-eight tiles feature black jellyfish and white dancing bears, pink poodles and gold tin soldiers. This classic game, which has been modernized with stylized drawings in whimsical colors, will delight adult and child alike. The $25 game is made from recycled stock and soy-based ink. Binth also offers One-of-a-Kind framed prints with names like “Wishful Fancy” and “Long Road to Happy.” Grays and blacks meld with dreamy yellows in these $44 artworks, which will decorate your loved one’s walls long after they’ve boxed up the last ornament. Chicagoan Taylor Zitman sculpts. She wraps pleading-eyed dachshunds in hotdog buns, then squiggles them with mustard. A Santa hat caps one, a sprig of mistletoe another. There’s a GI, a nerd, a superhero, a pirate. Molded from polymer clay, the mini-sculptures are baked and glazed. The hotdog dogs are two-and-a-half inches long and sell on Etsy for $10 to $15 apiece. Zitman also creates five-inch sculptures that start at $65. A Dessert Girl is dressed in a cinnamon-roll bra, while a Fruit Girl lounges in a banana body and an upside-down-peel hat. 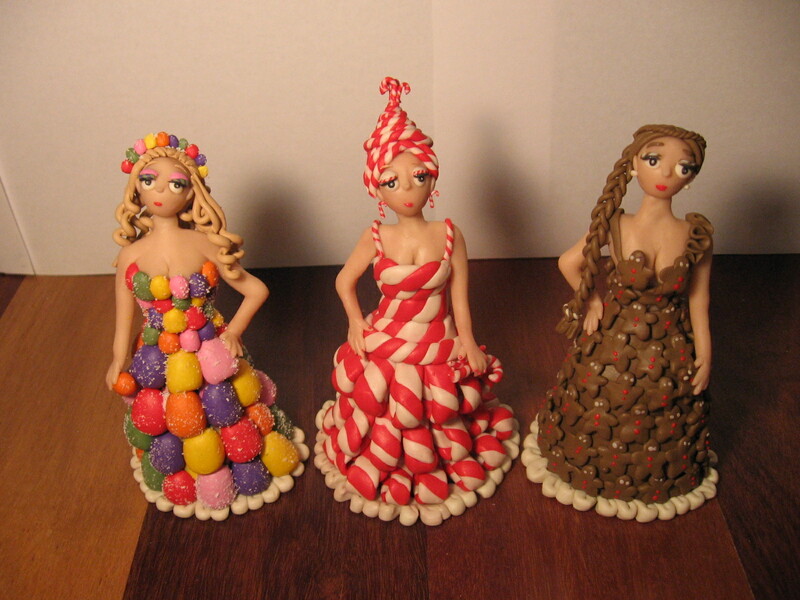 For Christmas, check out the Holiday Sweet Girls: Candy Cane, Gumdrop and Gingerbread. When sculpting her five-inch figures, Zitman always starts with the head. “Then I put it off to the side so I don’t squish it,” she said. “I can’t tell you how many times it’s rolled off the table.” At twenty-three, Zitman has a decade-and-a-half of sculpting experience behind her, and is often commissioned to create one-of-a-kind pieces. She rarely squashes the head anymore. Get a soy candle to warm the Grinch in your life’s heart. Once the wick burns down, the remaining candle holder can be repurposed as a decorative, painted glass tumbler for your eggnog or highball glass for your New Year’s Eve party. Evanston designer Suzie McKee, who creates under the name Zuz Design, is one of five artists who creates candles marketed by Crash. Choose from her holiday patterns, like art-deco Christmas trees or soft blue ornaments. There’s a gold-embossed “Joy, Peace, Goodwill” sentiment on one candle, and plenty of leaves, grasses, and swirls on non-holiday selections. Fragrances range from jasmine to ginger to sage. 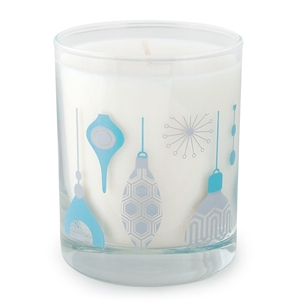 With screen-printed patterns fired onto the glass, and a burn time of fifty hours, the candles offer a big bang for $24. Crash Candles, 1283 Oakwood, Des Plaines, (847)813-9866, crashcandles.com. Marshmallows aren’t just for hot cocoa. A Chicago inventor took the concept of the mushy confection and molded it into a therapeutic, snake-like pillow. The Marshmallow Snake Wrap is knotted, then twisted and wrapped around the body to soothe whatever ails you. The lightweight wrap is stuffed with fiberfill to soothe your neck on long airplane rides or support your back during endurance contests on the Kennedy Expressway. The wrap costs $29.99, and comes in assorted color schemes. For the holidays, there’s a gingerbread design and a penguin pattern. The Marshmallow Snake Wrap also functions as a non-medical alternative remedy fot stomach cramps, bloating and indigestion. So if you eat too much of Aunt Edna’s pumpkin pie, find the closest couch, and grab your Marshmallow Snake Wrap. Twist it and lay on top of it. Relief will soon follow—as long as Aunt Edna doesn’t simultaneously insist on telling you about her gallbladder surgery. It’s every girl’s Christmas dream: jewelry in a square turquoise gift box—the famous Tiffany Blue Box. But if your mate can’t afford to spring for a Tiffany necklace, at least he can present you with a tray of Tiffany cupcakes from Amy Beck Cake Design. Amy Beck apprenticed under master cake designer Colette Peters in Manhattan. Five years ago, she returned to Chicago and launched her own custom cake company. Beck whips real butter, fresh cream and rich chocolate into couture creations. Her beautiful cakes are the hit of weddings, parties and special events. 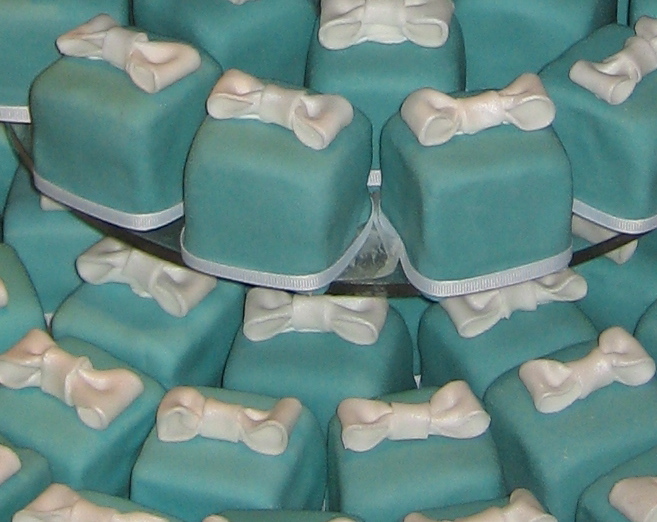 To make her Tiffany cupcakes, Beck frosts mini-cake cubes with Tiffany blue fondant icing. A perfect white fondant bow reigns from the top of each little cake. “We added a white fondant ribbon recently, so the confections look even more like Tiffany packages,” Beck says. The Tiffany cupcakes cost $8.50 apiece, and there’s a $250 order minimum for holiday parties. So go ahead, add an edge of elegance to your party. Amy Beck Cake Design, 636 North Racine, (312)545-3655, amybeckcakedesign.com. This Christmas, deck the walls with CTA “L” station signs. Citizen Shay photographs the “L” signs, and through an image-transfer process, creates conversation pieces in pinkish-red or hues of blue. 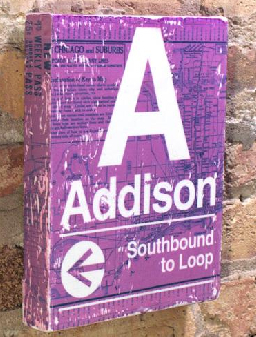 The Chicago artist’s “L” station canvases are more than one-inch thick and museum-wrapped. They feature bold lettering and directional arrows, layered over CTA maps. Choose the eight-by-ten-inch museum-wrap canvas, ready to hang, for $95. There’s also a $45 flat-panel version, which can be matted in an inexpensive frame of your choice. For sports fanatics, gift an “L” panel that reads “Wrigley Field, Southbound to Loop,” or “Soldier Field, Northwest to Loop.” Shay, a graphic designer who focuses on information design, is happy to accommodate custom orders. The busy elf can put your order together in two weeks. Before you put your presents under the tree, wrap them in paper that makes an impression. Snow & Graham, a card and gift company that began as a design studio, offers a lovely selection of modern patterns on supple papers. For Christmas, look for brown reindeer on baby blue or multi-colored tree lights on ivory. There are pine cone, snow globe and cocoa cup patterns too. Snow & Graham’s rainbow of colors includes everything from midnight blue to daffy daisy. 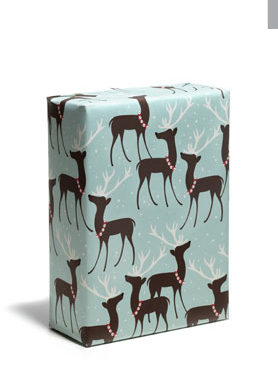 The Chicago company imprints their delicate wrapping papers with vegetable-based inks. Two flat sheets measure twenty by thirty inches each, and cost $6.50 online. Hanger 18 on Lincoln Avenue charges $3 per sheet. And remember, at Christmas, it’s not the present, it’s the wrapping paper that counts. Snow & Graham, North Ravenswood, (773)665-9000, snowandgraham.com. Celebrate like the Scandinavians, where Glögg symbolizes Christmas cheer. Glögg, or Glühwein, is a winter warmer that can be consumed at room temperature. But the traditional drink is best when heated, with raisins, almonds and cinnamon sticks stirred in. Glunz Family Winery & Cellars has been fermenting small-batch fortified wines since 1992, and they’ve won top awards at the Illinois State Fair. To blend their Vin Glögg, they begin with port and red wine. Then they mix in nut oils, citrus fruits and spices like clove, cardamom and nutmeg. 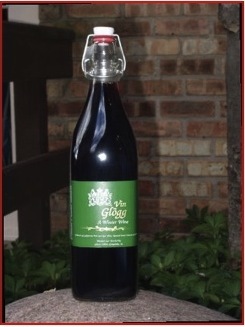 Vin Glögg can be purchased for $11 a liter at Glunz winery, ordered online or bought at Fine Wine Brokers in Chicago’s Lincoln Square. For a more personal experience, visit the Glunz Tasting Room, where you can sip favorites like Vintage Port and Raspberry Wine. The latter has a sweet fruit finish, and is ideal with or on top of cheesecake, vanilla ice cream or flourless chocolate cake. Glunz Family Winery & Cellars, 888 East Belvidere, Suite #109, Grayslake, (847)548-9463, gfwc.com. If chestnuts roasting on an open fire gets too hot for you, chill out with a game of Pengoloo. This board game is comprised of icebergs, carved penguins and painted wooden eggs. Each penguin is hollow and hides an egg under its igloo-like body. To play, roll the multicolored dice, then find eggs that match those colors. 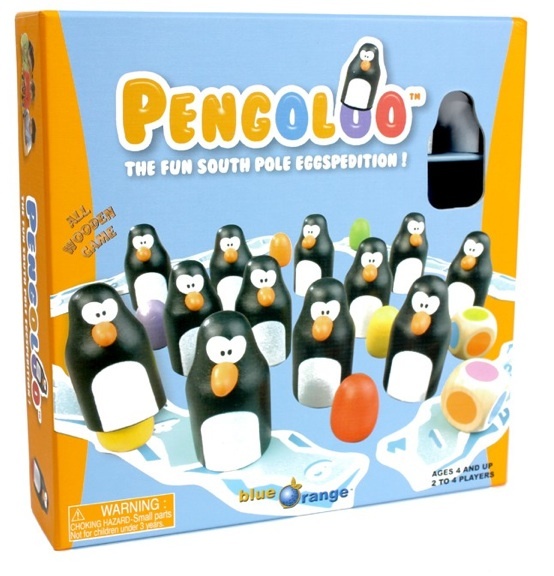 The winner is the first player to collect and line up six penguins and their associated eggs up on his arctic iceberg. “Pengoloo is perfect for Christmas because of the penguins, but it’s really a memory and concentration game you can play all year long,” says Joni Gatz-Bauman, program coordinator for MindMatters at Marbles the Brain Store. Pengoloo retails for $30. Marbles is a specialty store that sells games and puzzles that improve critical thinking, memory, coordination and visual perception. Other games include Chocolate Fix (a sweet game with Sudoku-like clues) and Cubebot (a cherry-wood coordination puzzle shaped like a retro robot). Marbles: The Brain Store has six stores (Chicago, Skokie, Naperville, Schaumburg), including a location at Water Tower Place, 845 Michigan. (877)527-2460, marblesthebrainstore.com.